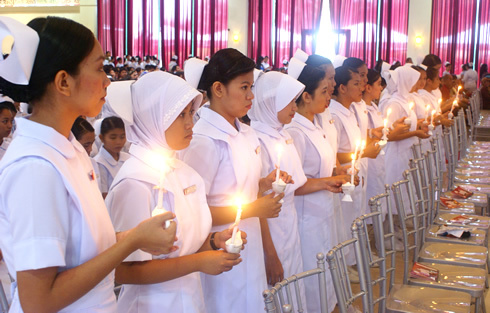 Clad in white, student nurses during the solemn candle lighting ceremony. Western Mindanao State University-College of Nursing held its 37th Capping, Badging and Candlelighting Ceremony at the Astoria Regency last July 26. The presentation of candidates for Cap and Badge was led by the College of Nursing Dean, Dr. Gloria G. Florendo and was accepted by the University President, Dr. Grace J. Rebollos. It was followed through by the imposition of caps to the female students and badge to the male students by the Dean and was assisted by the Associate Dean-Prof. Vicente J. Gaan, BSN Program Head-Prof. Mary Joselyn C. Biong, Clinical Coordinator-Dr. Sarah S. Taupa, Level II Coordinator-Prof. Evelyn Rendon and Community and Extension Coordinator-Prof. Miriam O. Kanti. The imposition of caps and badges on the 502 would-be nurses signified a major transition in their life as student nurses. The ceremony will commence their first exposure in the hospital settingand the student nurses will be deemed skilled in bedside care and other actual nursing responsibilities. Dr. Jamella Imlan-Marbella, Medical Officer of the City Health Office was the event’s guest speaker. In connection with the event’s theme, “Nurses Providing Accessibility to Universal Health Care”, she stressed out the nobility of the nursing profession and inspired the student nurses not to dwell on the setbacksof the employment conditions.